Thanks to everyone who dropped in and commented about my first post on Amsterdam. Really appreciated the discussion. But before I move on to the next city along the Chocolatour, I’ve got to share a bit more about the city of 165+ canals with you. We had a terrific 3-hour walking tour with Bobien van Aalst, a most knowledgeable guide who speaks 5 languages and was fun to be with. If you do find Amsterdam in your plans, I highly recommend getting in touch with her to arrange a customized tour. You may contact Bobien at: bobien.vanaalst@orange.nl. Bobien is a terrific example of the cosmopolitan nature of the Dutch. Everyone learns English in the public school system, as it is part of the curriculum. And with 42% of Amsterdam’s residents originating from another country, you can really sense the multi-cultural layers of the city. Yet, English is widely spoken, making Amsterdam a traveller-friendly place for North Americans, Brits, Australians and residents of other English-speaking nations. I mentioned the physical beauty and charm of the city, the abundance of bicycles, and the culinary delights in the last post. This week, I’d like to feature 2 things for which Amsterdam (and Holland) are widely known: the beauty and abundance of tulips and the worldclass airport that greets you upon entering the country by air. I’m not much of a gardener. Having bad knees that prohibit me from kneeling or squatting for any length of time have me doing most of my gardening in raised planters and flower pots. But I couldn’t resist the abundance of tulip bulbs we saw in the amazing flower market — known as the Bloemenmarkt and located along the Singel Canal between Dam Square and Rembrandtplein. I’m told there are 600,000 bulb flowers planted in parks and public gardens throughout Amsterdam. It looked to me that there were as many bulbs in packages and baskets at the flower market! 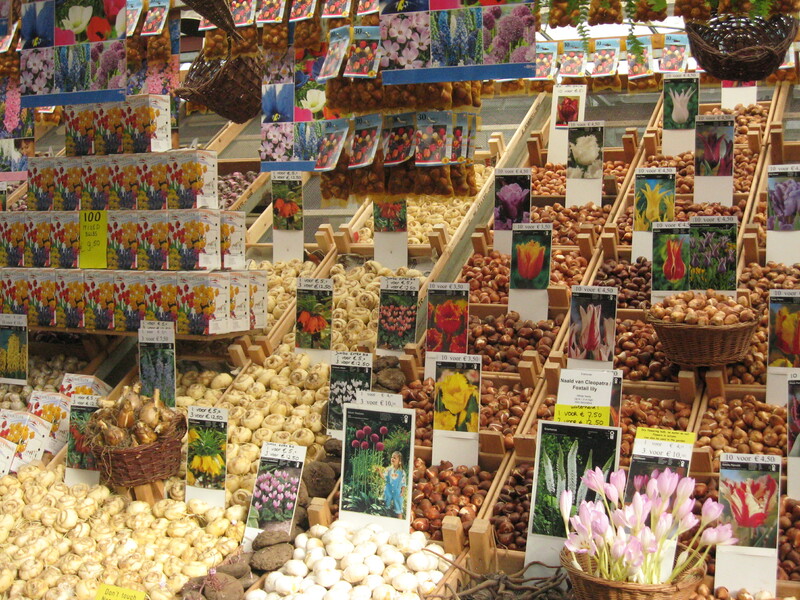 I’ve never seen so many flower bulbs (mostly different varieties of tulips.) It was enough to get any gardener excited and reaching for her wallet. The prices were reasonable. I got a bag of 10 bulbs for 4.5 euros. These are multi-coloured lily-style tulips, and with any luck, they’ll peek out of the ground next spring. Be sure to buy bulbs that are bagged specifically for export to North America or you may have problems with customs. Our time in Amsterdam went far too quickly. We’ll have to return! But after three days, it was time to head to Schiphol International Airport, where we would catch our flight to Barcelona. Schiphol is an amazing airport. It has been voted the best airport in Europe, and its duty free shopping is said to be among the best in the world. My kind of place! Plus, Schiphol has a terrific assortment of restaurants and bars in which to while away the hours waiting for your flight. We chose the Bubbles Lounge, which had amazing sushi, a beautiful setting where you could watch the aircraft coming & going, and a convenient location right next to Café Chocolat, where you could buy an astounding assortment of chocolate creations. Great way to end our time in what is now one of my favourite cities. Is Amsterdam one of your favourite cities? Or is there another part of Holland that has your heart? Having not been outside the city (other than the relatively short jaunt from the airport) I’m anxious to hear your thoughts. Be sure to subscribe to this blog, or stop back the week of November 8th for my post on our next stop along the Chocolatour: Barcelona.